The Fox News anchor’s war stories have been exposed as lies. And it’s all good. Here’s the headline from Variety: “‘The O’Reilly Factor’ has long been the most popular program in cable news, and the controversy surrounding host Bill O’Reilly’s war-reporting experiences has only helped elevate the show’s ratings.” Yes, that’s right. Fox News’s most famous host has been exposed (yet again) as both a serial fabricator and a bully to those who call him to account. Still, it’s all good. His ratings are rising to the point that, in the key demo that matters (adults 25 to 54), he now brings in four times the audience of his nearest competitor, CNN’s Anderson Cooper. (MSNBC is not even close.) The New York Times estimates that O’Reilly made over $100 million for Fox last year. Apparently, that entitles him to spout whatever nonsense he likes, with no accountability whatsoever, for a reported salary of $20 million a year. A pretty sweet gig, that. I’ve argued in this space recently that, as Jon Stewart and Stephen Colbert have been demonstrating all these years, the only way to treat Fox is as comedic material. How painfully ironic that, with Colbert gone (at least for now) and Stewart going, it’s more than ever time for the so-called real reporters of the mainstream media to finally wake up to the lesson taught by their journalistic superiors… at Comedy Central. To recap briefly, the mainstream media and the liberal blogosphere have recently been filled with stories in which O’Reilly placed himself at the center of world-historical events—or in imminent danger—and was found to be full of it. 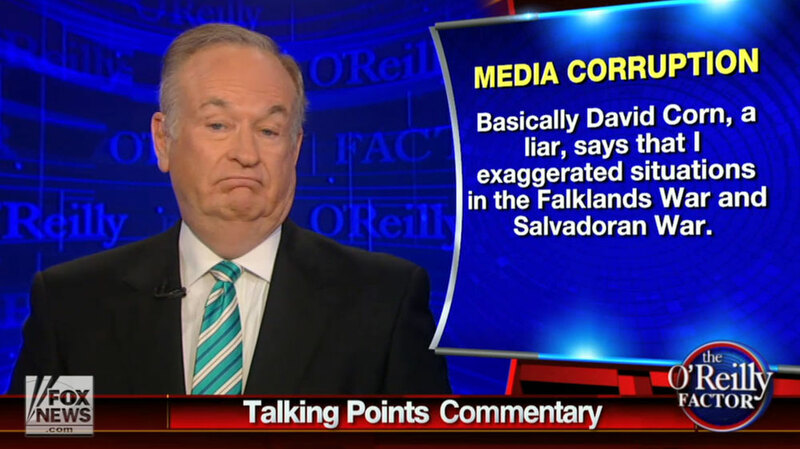 Contrary to O’Reilly’s claims, he was more than 1,000 miles from the Falkland Islands during the war there. He did not see any nuns murdered in El Salvador. He did not cover the “troubles” in Northern Ireland. He was not threatened by rioters in Los Angeles, and he was nowhere near the suicide of a man who claimed to have information about the assassination of President Kennedy. For all we know, he may not even be named Bill O’Reilly (though there’s apparently no truth to the rumor that he stole the dog tags off a dead soldier in Korea). What is perhaps most disturbing about this story is the bifurcated reaction of the mainstream media. Almost no one who occupies a chair in a “respectable” media organization has taken the position that O’Reilly is a liar and Fox is filled with liars and it’s about time we stopped taking the network seriously as a news source. Rather, we hear from Politico’s Dylan Byers that “the Bill O’Reilly charges aren’t sticking.” Gabriel Sherman of New York magazine believes they have “backfired.” Jeremy Stahl in Slate says the case is “open to interpretation.” And a front-page New York Times analysis by Jonathan Mahler and Emily Steel describes O’Reilly as “a man who perhaps more than any other has defined the parameters and tenor of Fox News, in the process ushering in a new era of no-holds-barred, intentionally divisive news coverage.” The Times reporters leave it to the experts to decide whether what he says is true, though some of these experts—not incidentally, also cable-news veterans—are not so sure that it matters. “Bill’s credibility with his audience is not based on his record as a traditional journalist,” former CNN/US president Jonathan Klein told the reporters. “His credibility, in the view of his fans, is based on his trenchant analysis of the events of the day, his pulling no punches, his willingness to call it like it is”—which is apparently the way one defines lying, prevaricating and bullying in the world of cable news (and the Times’s “expert” sourcing). With all the money it makes and all the viewers it misinforms, Fox News has become a kind of Frankenstein’s monster of the mainstream media’s own creation. O’Reilly, Ailes and Murdoch are not trying terribly hard to fool anyone. They know what business they’re in; they are feeding red-meat propaganda to (mostly elderly, white) right-wing knuckleheads. But the rest of the media allowed them to pretend to be an honest, albeit “controversial,” news organization, even as Fox sought to undermine the meaning of “news” in American political debate as well as in the professional canons that underlie it. And by consistently pretending these clowns are serious—well, now the joke’s on us.